Coffee lovers, we heard you! 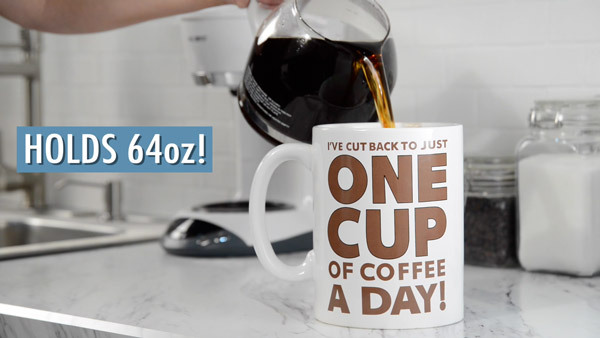 You now have a correctly-sized portion for your morning brew with the half gallon Gigantic Coffee Mug. 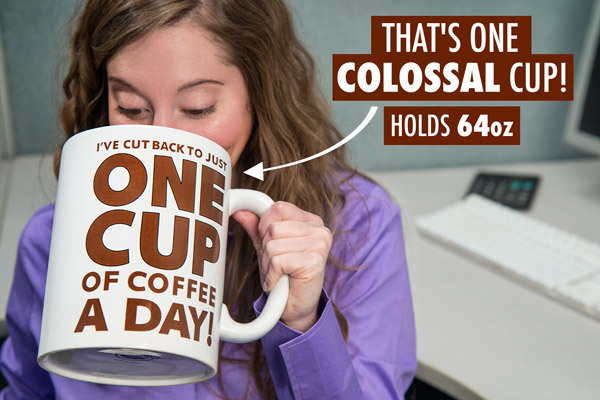 This colossal cup holds 64 ounces of coffee, otherwise known as a "Monday-sized serving". 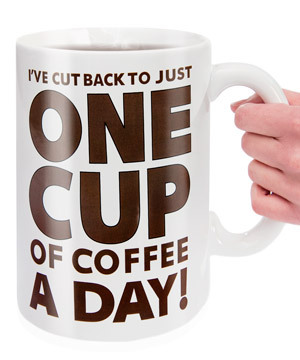 Big, bold brown letters on each side state, "I’ve cut back to just one cup of coffee a day!" so people know you’ve got a sense of humor about your caffeine cravings. Keep the humorously huge Gigantic Coffee Mug in your kitchen to let guests know that you take coffee seriously, or use it as a desk decoration to proudly proclaim your percolating passion. When it comes to gift giving, the best way to stand out is to do it jumbo. That’s why the Gigantic Coffee Mug is a great gargantuan gift for the coffee lover in your life. 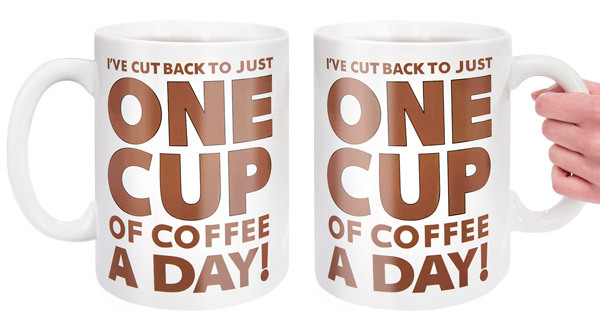 The clever ceramic cup embraces coffee addiction with its eye-popping size and witty writing. Your dark roast-loving recipient will get a laugh out of this “single serving” present. Don’t settle for a cup of joe—have a whole pot of it! This colossal cup is a seriously sizable way to indulge in your roasted passion. The Gigantic Coffee Mug is over seven inches tall and holds 64 ounces so you can make yourself a behemoth brew. Even if you don’t quite have a half gallon hankering, you’ll love the looks you get from your coworkers when you bring your new mug into the break room. 8 creams and 16 sugars, please. If you decide to cut back your caffeine intake, use the Gigantic Coffee Mug as a decorative desktop storage container instead. The mammoth mug has the size to comfortably fit awkwardly large items like rulers and business envelopes so you can clear up your desktop clutter while still reminding people you love the brew. 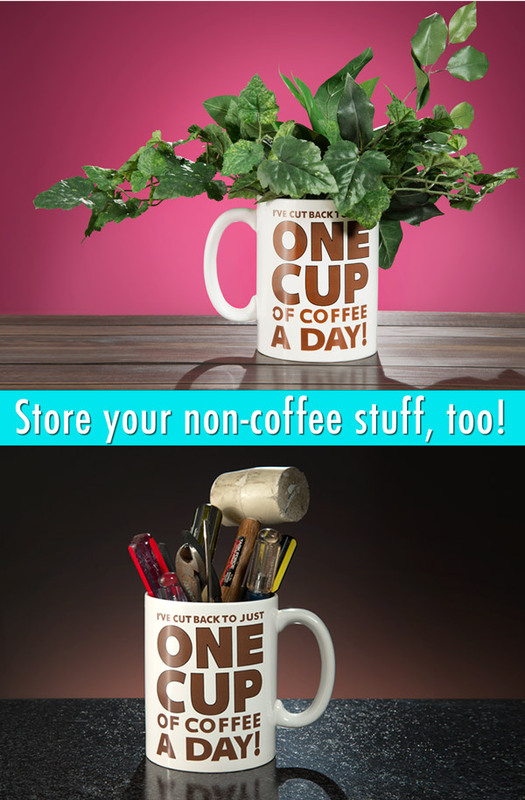 This mammoth mug can jumpstart your heart and your de-cluttering efforts! Large brown letters on the Gigantic Coffee Mug state, “I’ve cut back to just one cup of coffee a day!” The silly sarcastic slogan is written on both sides of the mug for all to appreciate. Bring the comical cup to the office and let your coworkers know that you enjoy a good joke as much as good java. Writing appears on front and back of cup. Question: Is this hard to lift? Answer: The Gigantic Coffee Cup weighs a little over two pounds when empty. Depending how much liquid you pour in, it could get pretty heavy but it will certainly not be unbearable. Question: Is it dishwasher and microwave safe? Answer: The mug is microwave safe (assuming you can fit it) but we recommend hand washing so as not to risk ruining the lettering on the mug.